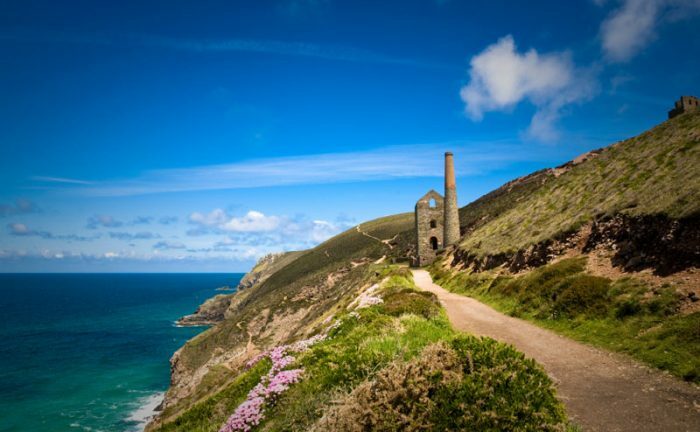 The South West Coast Path takes you through four English counties all bursting with delightful regional produce. In this guide, we will give you an overview of particular gastronomy to look out for and some guidance on where to eat when you are on the route. Before we get specific, we should point out that being a coastal route, the seafood is spectacular all the way around the South West Coast Path. While one County might claim to have the best fish ‘n’ chips or oysters or mussels, they are pretty much amazing right the way around the coast. The first couple of days on the South West Coast Path are walking through Somerset. While you wont be spending a great deal of time here, there are some legendary local treats to keep your eye out for. Let’s get the big ones out of the way. Somerset is famous for its cider and its cheddar. 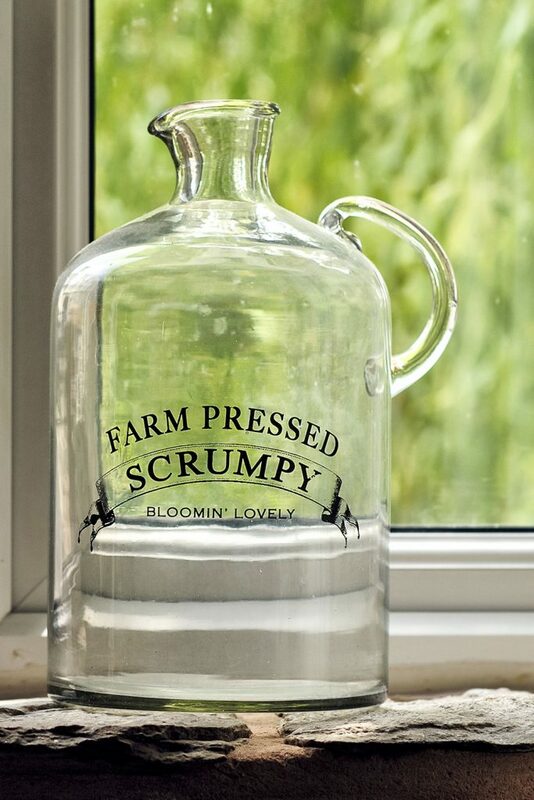 Cider comes in all shapes and sizes, from your cloudy scrumpy with indeterminate strength and usually mind-melting properties, to refined, gentrified ciders, bottled to look like champagne rather than being sold in flagons. As far as cheese goes, you should be looking out for some Cave Matured Cheddar from Cheddar Gorge or Barbers 1833 Vintage Reserve Cheddar. Both smooth, creamy and delicious, with layers of flavour. You will pass along the North and South coasts of Devon on the South West Coast Path and while here, you will definitely want to sample some of the wonderful local specialities. On the savoury front, like its neighbours Devon is famous for its cheese. Devon Blue, is one that particularly stands out. In fact, it is dairy that really dominates in Devon. You cant pass through without trying at least one Devon cream tea, and I doubt that one will be enough. 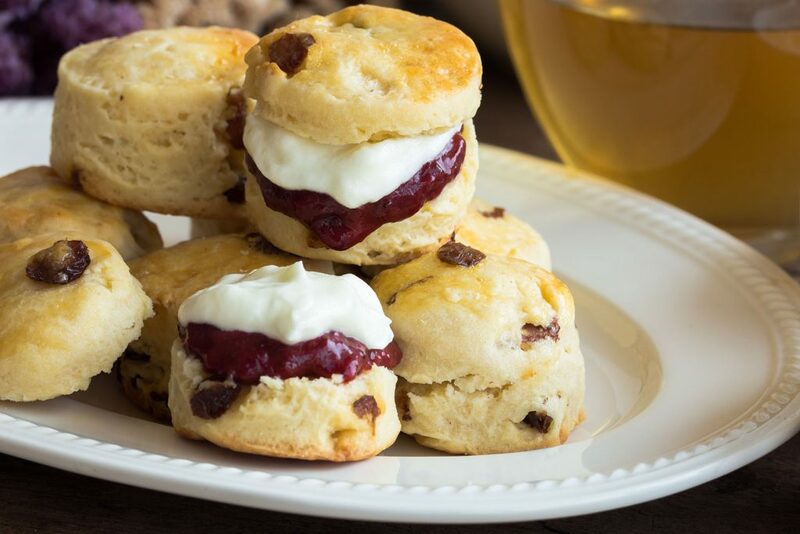 Clotted cream is said to have been invented here (though other counties dispute this) and they really know how to do it well. If the sun is out, there is nothing creamier and more delicious than Devon ice cream. Devon has its fair share of cider too, but there are a couple of other alcoholic staples from Devon. Plymouth Gin is a staple of Devon life. Not brought to life during the recent ‘craft gin’ scene, Plymouth Gin has been made here since 1793 and can compete with any of the young upstart gins on the market. Carmel Valley sparkling wine is also well worth a mention. Delightful, light fizz, bursting with enough flavour to be favoured by the Queen, it is definitely worth getting your hands on a bottle or two. It is so tempting just to talk about pasties here, but there is so much more to Cornish cuisine than this. 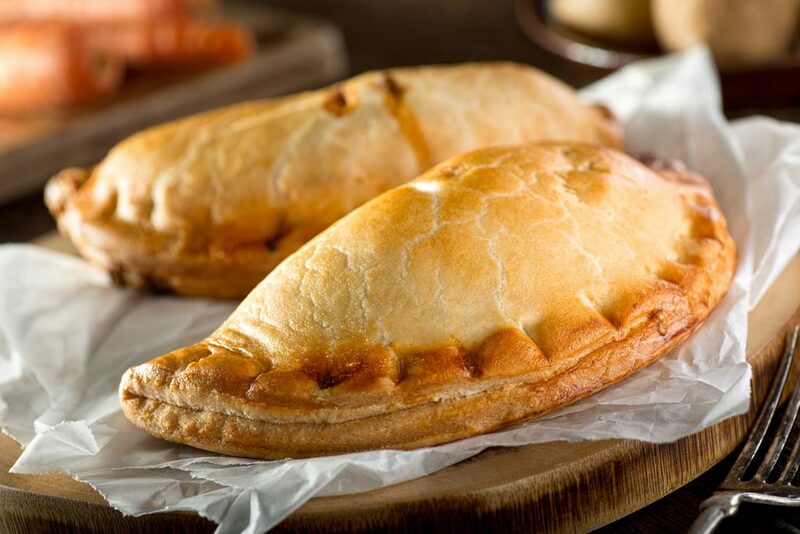 Cornish pasties are a mix of potato, suede, onion and beef, neatly wrapped in crimped pastry. This pocket size wonder is a great snack to eat on your walks. 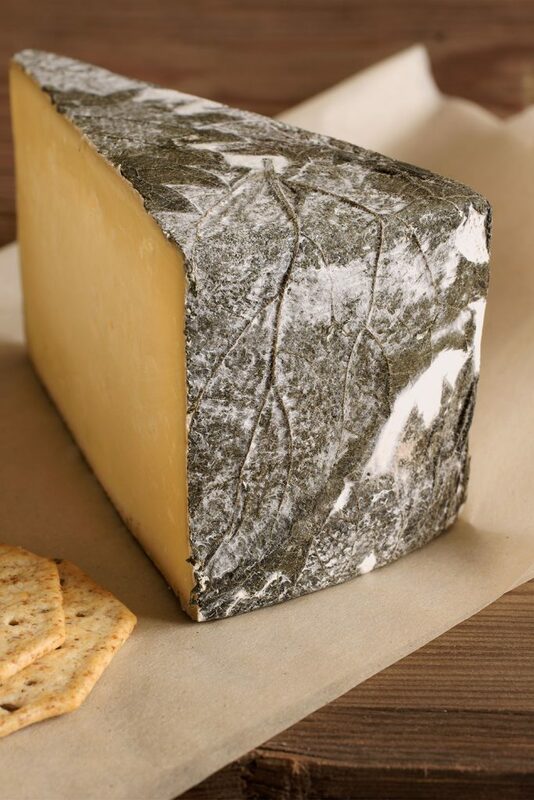 Competing with its neighbouring Devon as far as ice cream, clotted cream and cheese goes, it is up to you to sample it all and decide which is the best, however, we would definitely recommend trying some Cornish Yarg. This cheese, wrapped in nettles is a deliciously creamy cheese with a good crumbly centre. 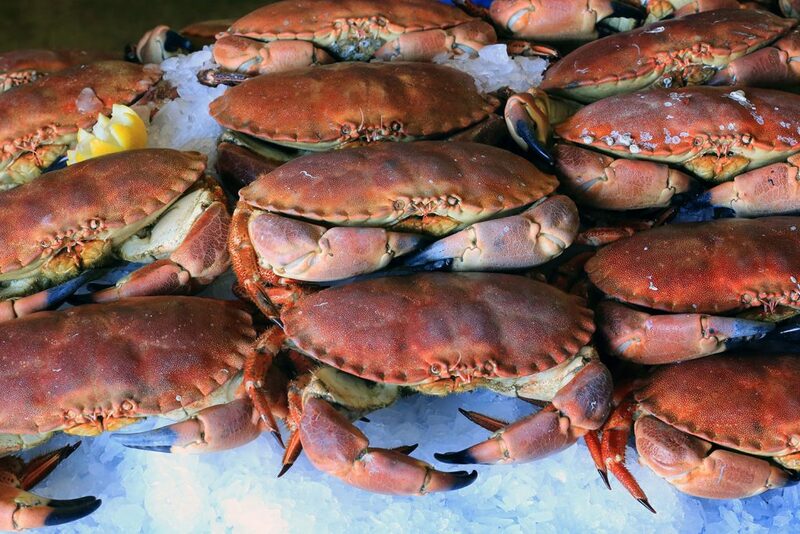 Oh, and while we mentioned that the seafood was all the same around the coast, Newlyn Crab is perhaps the exception to this. Newlyn crab sandwiches or even better crab soup are highly recommended. The final stretch along the SWCP is through the incredible scenery of Dorset, but does the gastronomy match the scenery? Well, the answer is yes. Unique to Dorset is the Portland lamb. Rescued from the endangered species list, Portland lamb is a rare and delicious delicacy. The sheep take longer to mature and need to be hung for longer which produces silky smooth meat that melts in the mouth. 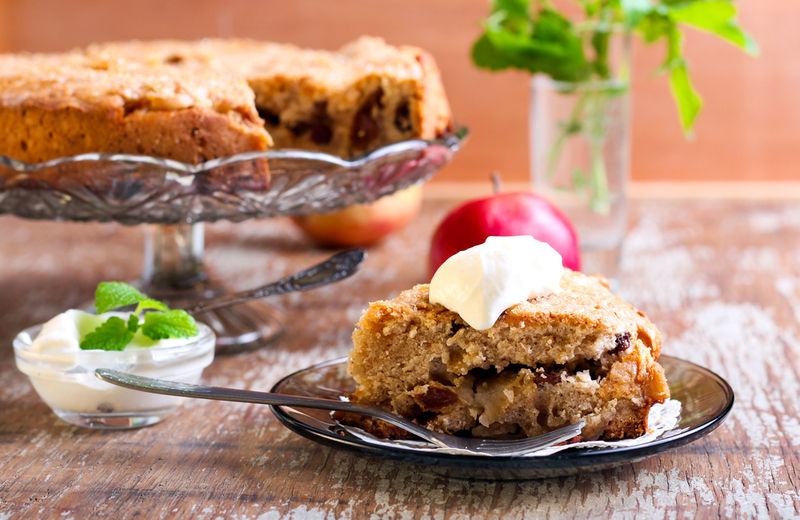 Apple cake is another Dorset staple and it is recommended to be eaten with a hearty dollop of clotted cream. While we are on sweet things, it is a good idea to get your hands on some Dorset Knobs. While there is great scope for some Carry-On humour, these are actually little, sweetened bread balls which are a great source of hiking energy. A hearty, home cooked breakfast is included in your trip, so you don’t have to worry about that particular meal. For lunches, the best thing to do is check your information pack each day to see if there are any stops available to pick up lunch. If not, there is generally a tearoom, bakery or shop in town where you can pick up supplies, or if you ask your accommodation provider the night before, they will be more than happy to put together a packed lunch for you. With evening meals, it is always a good bet to ask your hosts for a recommendation for dinner, but we also have a few tips for where to eat along the way. Such is the massiveness of the path, that we are not going to recommend somewhere for every night you stay on the route. However, a great tip is to ask your hosts in each location where you should eat as they know the lay of the land, which restaurants are up and coming and which have had their day. However, we do have a few suggestions for the route. The route is strewn with amazing pubs with almost each town claiming to be the oldest in England, or oldest in Cornwall or some other age based claim. You are generally guaranteed a good atmosphere, some decent food and local ales, but there are a few that we defintely recommend. The Williams Arms in Braunton on the first section of the path is a 16th Century, thatched roof pub with an exceptional menu and a carvery with locally sourced meats. The Bush Inn in Morwenstow is a 13th Century pub with a very modern outlook. Fresh, tasty pub grub served in this family-run pub. The Tinners Arms in Zennor is as it has always been. A proper good pub, built in stone and wood and much the way it has always been for the last 700 years. The Ship Inn in Porthleven is an old smugglers den, built into the cliffside, with a remarkable view over the harbour. Again, you will find a plethora of great restaurants all along the South West Coast Path. Seafood is king and each town will have its claims to the best fish n chips, and most places will have a good choice of different places to eat, so if you are not a fan of seafood, don’t worry, the choice is endless. So, going anti-clockwise, following the path, we would recommend firstly the Rising Sun in Lynmouth. Set in a 14th Century harbourside cottage, the ambience and feel of the place are equally matched by the outstanding locally sourced cuisine. The Kings Arms in Georgeham is a staple of the SWCP and an ideal stop for lunch. Favoured by walkers for its high-quality, innovative pub grub, it is a great spot to refuel during your walk. Further down the coast in Cornwall, you will find the delightful Watergate Bay Hotel. Here you have a choice of which restaurant you want to eat in, depending on how you are feeling that night. We ate in Zacry’s Restaurant and it was clean, modern dining that was a taste sensation. Down in Padstow, you have one of the most famous restaurants on the path, in Rick Stein’s The Seafood Restaurant. Fresh, delightful and well thought out menu and if the price tag or availability prohibits you, there is always Stein’s Fish and Chips, or the Rick Stein Cafe as a backup. Jude Kereama sneaks in little hints and techniques from Asian cuisine into the fresh, imaginative menu. Along in Torquay there is the excellent Elephant. It has a Michelin Star, so you know that you are in for an amazing experience dining here. With a dedicated farm to ensure the produce is fresh and of great quality, the Elephant is well worth a visit. Book early though! While many of these restaurants are on the pricier end of the scale, they really showcase what this part of England has to offer and it is well worth indulging yourself for at least one night.